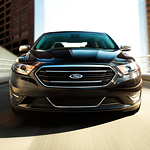 When you're looking for luxury and plenty of room for your family, the Ford Taurus delivers. The SHO grille on the front of the vehicle offers a unique look to the car, setting it apart from other sedans. As you look at the shape of the vehicle, you'll see that it has an aerodynamic design that conveys unlimited motion. The Ford Taurus has been designed so that it has powerful features from the inside out including stunning wheels and LED lighting. HID headlamps are a unique feature for the Taurus. The lights will come on when the windshield wipers are on or when the light outside is low. LED taillights are brighter, making it easier for other drivers to see you on the road. From a heated steering wheel to the heated and cooled front and rear seats, everyone in the vehicle will stay comfortable at any time during the year. Suntrup Ford can set up your Sony Audio System as well as your navigation so that it's easy to find any location on the map.